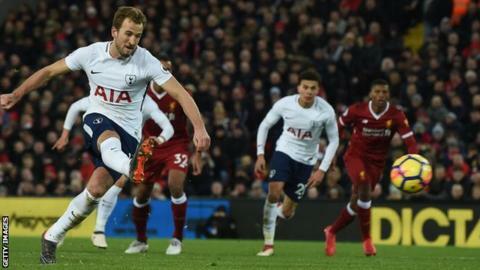 Harry Kane's penalty - converted with virtually the last kick of an enthralling encounter - gave Tottenham a vital point at Anfield after Mohamed Salah's brilliant stoppage-time strike looked to have given Liverpool victory. Liverpool had only seconds to survive when referee Jon Moss pointed to the spot after Virgil van Dijk collided with Erik Lamela - allowing Kane, who had missed an earlier penalty, to score his 100th Premier League goal and leave the home fans enraged. Salah's third-minute goal, scored after he intercepted Eric Dier's poor back pass, gave Liverpool a lead they held until 10 minutes from time when Spurs substitute Victor Wanyama lashed keeper Loris Karius' punched clearance back into the top corner from 25 yards. In a dramatic finale, Karius saved Kane's penalty after he brought down the striker, paving the way for Salah to weave his way into the area before lifting a finish over Spurs keeper Hugo Lloris at the start of five minutes of stoppage time. And after Moss awarded Kane a second opportunity from the spot, the England international placed his penalty into the bottom-right corner. It was a fitting end to a thriller and a result which will bring more satisfaction to Spurs as defeat would have left them five points adrift of Liverpool in the race for a place in next season's Champions League. Liverpool remain third in the Premier League table, two points ahead of Tottenham in fifth. When manager Jurgen Klopp set off on a sprint of triumph along the touchline in front of Anfield's giant Main Stand as Salah put Liverpool back in front in injury time, he thought he was celebrating a win that was opening up a crucial five-point gap between his side and Spurs. Instead, minutes later, he was left to reflect on the concession of a late equaliser that left Anfield enveloped in frustration. Liverpool's much-maligned defence had held firm for so long, but Klopp's switch to three at the back, when he sent on Joel Matip for James Milner in the final quarter of an hour, did not have the desired effect. Spurs played on Liverpool's nerves, although Karius, who remains an inconsistent presence, could hardly have expected his punch - when perhaps he should have caught - to be returned into the top corner of his net with such spectacular interest by Wanyama. Liverpool, and indeed Anfield, were suddenly on edge but relieved when Karius saved Kane's lame penalty. Then came that dramatic exchange of goals in a chaotic finale and the points were shared. Liverpool offer so much that is good when it is measured in goals and excitement, but that nasty habit of carelessness and conceding crucial goals has still not been cured. Liverpool's supporters were waiting to celebrate a vital victory after Salah's twisting, turning run into the area in stoppage time ended with a clever finish over the onrushing Lloris. It came just after Kane had missed the chance to give Spurs the lead from the spot when his uncharacteristically poor penalty was saved by Karius. And yet the cheers stuck in the throats as referee Jon Moss - who entered lengthy consultation with his assistant before finally awarding the first Spurs penalty - waited as Van Dijk tangled with substitute Lamela, looking towards his colleague once more before pointing to the spot. The Kop exploded in fury but Kane stayed calm and made no mistake the second time, beating Karius comfortably. Klopp was desolate as he was locked in conversation with fourth official Martin Atkinson. There was barely time to restart the game and Anfield instantly vented its anger on Moss after awarded Spurs two penalties in front of the Kop. Once the drama had subsided, this was a fair result between two teams who mix high quality, intensity and attacking intent with moments of vulnerability - leaving the top four chase as tight as ever. Spurs could have been forgiven for fearing the worst when Eric Dier's carelessness let in Salah as early as the third minute, instantly evoking memories of their struggles when visiting other teams in the so-called "big six" in recent years. Mauricio Pochettino's side have not won away in the league against Arsenal, Chelsea, Liverpool, Manchester City and Manchester United in 11 game stretching back to a 2-1 win at Etihad Stadium in February 2016. And yet they can take massive encouragement away from Anfield after the manner in which they kept their composure and played their way back into contention after Liverpool dominated the first half. Spurs kept probing and even when Salah's second looked to have condemned them to certain defeat - seemingly even more of a blow after Kane's missed penalty - they gathered themselves for one late push that earned another spot-kick and a point. Pochettino's players have been accused of fluffing their lines on occasions like this in recent times. Here they deserve great credit. Liverpool manager Jurgen Klopp: "There were so many situations to talk about but the ref's decisions decided the game so I can't help but talk about them. "I don't understand either of the penalty situations. The first one was offside and the second, I know already what the ref and his assistant will say. There was a touch, a little touch. But Lamela has jumped into him and wanted the touch and to go down. "If the ref kept playing at that level then fine, but in the first half he wasn't giving fouls. Then for the softest touch of the whole game he decides it is a foul. "In the second half we had to defend like crazy, they had to chase the game. We had counter-attacks, the high pressure was good and we put in some super crosses. "We were a bit unlucky here and there but we had enough chances to win the game. And we would have if it wasn't for those decisions." Tottenham manager Mauricio Pochettino: "It was an amazing game to watch - two teams that always try to play exciting football. "I was calm because the team plays so well. The feeling is we dropped two points. We were much, much, much better than Liverpool. "Both were a penalty and it is not controversial. Sometimes people complain about the referee, but when they are right it is good to tell everyone. "It was important, the character. When you analyse the game, it was always under control despite conceding the first goal. When you analyse the 90 minutes, Tottenham were much better. "We always try to give our best. The team always shows personality and character. Today was a game we played for the win, and to change history you need time." Tottenham striker Harry Kane after scoring his 100th Premier League goal: "I was nervous before the second penalty. It was a big moment, with a lot of pressure, but I stuck to the routine. "There was a lot of pressure, in front of the Kop. The first one, I did everything I wanted to and the keeper made the save. You've got to take the chances. I thought the second one was a penalty; the defender took out Lamela. "The gaffer said at half-time: Play a bit quicker. We created some chances. Victor Wanyama scored a great goal, and if I scored the first penalty we probably would have won it. But there we are. I've had a good season in front of goal so let's see how many I can get now." Liverpool travel to Southampton for next Sunday's late Premier League kick-off (16:30 GMT). Tottenham host Newport County in their FA Cup fourth-round replay on Wednesday (19:45), and return to league action on Saturday in the North London derby against Arsenal at Wembley (12:30). Match ends, Liverpool 2, Tottenham Hotspur 2. Second Half ends, Liverpool 2, Tottenham Hotspur 2. Goal! Liverpool 2, Tottenham Hotspur 2. Harry Kane (Tottenham Hotspur) converts the penalty with a right footed shot to the bottom right corner. Penalty Tottenham Hotspur. Erik Lamela draws a foul in the penalty area. Substitution, Tottenham Hotspur. Fernando Llorente replaces Son Heung-Min. Goal! Liverpool 2, Tottenham Hotspur 1. Mohamed Salah (Liverpool) left footed shot from the right side of the six yard box to the top right corner. Penalty saved! Harry Kane (Tottenham Hotspur) fails to capitalise on this great opportunity, right footed shot saved in the centre of the goal. Penalty Tottenham Hotspur. Harry Kane draws a foul in the penalty area. Penalty conceded by Loris Karius (Liverpool) after a foul in the penalty area. Goal! Liverpool 1, Tottenham Hotspur 1. Victor Wanyama (Tottenham Hotspur) right footed shot from outside the box to the top left corner. Substitution, Liverpool. Joel Matip replaces James Milner. Attempt missed. Harry Kane (Tottenham Hotspur) header from very close range is too high. Assisted by Erik Lamela with a cross following a corner. Corner, Tottenham Hotspur. Conceded by Dejan Lovren. Substitution, Tottenham Hotspur. Erik Lamela replaces Davinson Sánchez. Dele Alli (Tottenham Hotspur) is shown the yellow card. Dele Alli (Tottenham Hotspur) has gone down, but that's a dive. Attempt blocked. Dele Alli (Tottenham Hotspur) right footed shot from outside the box is blocked. Assisted by Christian Eriksen. Attempt blocked. Alex Oxlade-Chamberlain (Liverpool) right footed shot from outside the box is blocked. Dangerous play by Ben Davies (Tottenham Hotspur). Substitution, Liverpool. Georginio Wijnaldum replaces Jordan Henderson. Substitution, Liverpool. Alex Oxlade-Chamberlain replaces Sadio Mané. Attempt blocked. Mousa Dembélé (Tottenham Hotspur) left footed shot from the centre of the box is blocked.